In the wake of what US (and international) media celebrated as a diplomatic victory for North Korean leader Kim Jong Un during last week's US-North Korea summit in Singapore, Kim on Tuesday traveled to Beijing for a two-day visit, where he filled Chinese President Xi Jinping in on the details of his discussion with President Trump, according to NBC News. Kim's visit comes a week after Secretary of State Mike Pompeo met with senior Chinese officials. According to initial reports, Chinese President Xi Jinping praised Kim for making headway with the US. According to Bloomberg, Chinese state television reported that Xi promised Kim that China would keep supporting North Korea, and Kim promised Xi that the North "would upgrade bilateral ties with China to a new level." Xi added that he hopes the North and the US will work toward peace on the Korean peninsula, and applauded the US's decision to halt joint military exercises with South Korea. Such effusive praise from China's leader is only the latest sign that Kim's benefactor has perhaps been the driving force behind Kim's bid for peace. "I expect they will talk about the path going forward and where priorities should lie," Glaser said. Those priorities, from China's perspective, would be to ensure that Beijing is included in any in peace treaty talks and for creating an environment on the Korean Peninsula that will make it unnecessary for U.S. troops to remain. This is Kim's third trip to China this year. He made his first foreign trip as head of state in March, when he traveled by train to meet with Xi in Beijing. 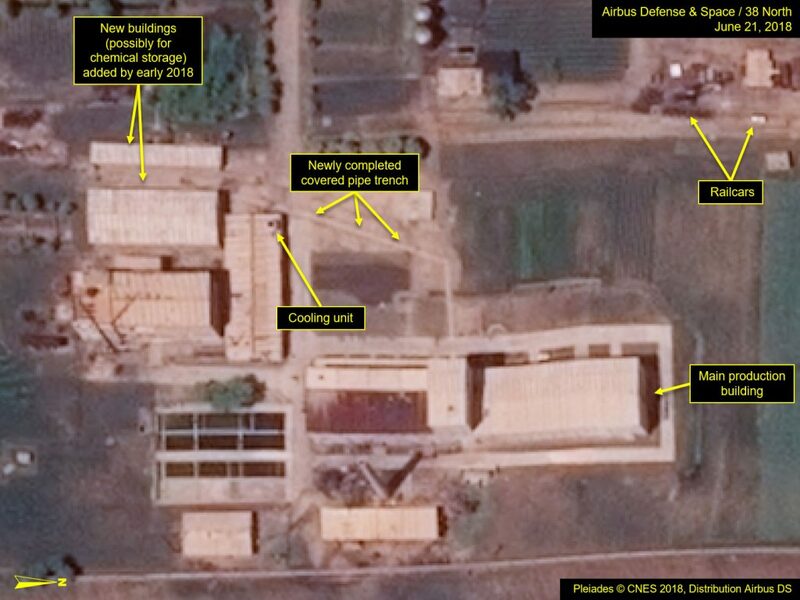 China is North Korea's largest economic ally and is responsible for 90% of trade with the isolated state. The suspension of US military exercises has been a policy goal pursued by Beijing and Pyongyang for years - and Xi is undoubtedly pleased at Kim having won such an important concession. But there was something else unusual about this summit that hinted at China's dominance. As Reuters pointed out, China made the unusual decision of announcing Kim's visit ahead of time, and stipulating that he would stay for two days. During previous visits, China would only confirm that Kim had visited with Xi after he had already left. Still, Chinese leaders did take precautions to shield Kim's visit from public view by erecting a large screen outside the East Gate of the Great Hall of the People, where Chinese leaders typically meet with foreign leaders. As the diplomatic efforts between the North and US move forward, we doubt this will be Kim's last visit to Beijing. And if President Trump has his druthers, Kim might also soon be visiting another powerful capital. But as we noted earlier, China could still scuttle the talks if it decides to retaliate diplomatically to the trade war with the US. Xi could order Kim to withdraw from negotiations, effectively undoing the progress that has been made. The suspension of a joint military exercise by Washington and Seoul shortly after a number of concessions by Pyongyang amounts to adopting the ‘double freeze’ strategy, long advocated by Russia and China, experts told RT. The “historic” four-point document that US President Donald Trump and North Korean leader Kim Jong-un signed following their landmark meeting in Singapore is more of a declaration of intent than a roadmap for an actual resolution of their differences, experts told RT. But even such a vague promise of a less hostile future can bring benefits, at least in the short term. “The agreement itself is just the first step” on the long road to improving the relations between Washington and Pyongyang, Konstantin Asmolov, a senior research fellow at the Korean Studies Center of the Russian Academy of Sciences’ Far East Institute, told RT. Both sides took some concrete steps to de-escalate tensions that are not mentioned in the document. 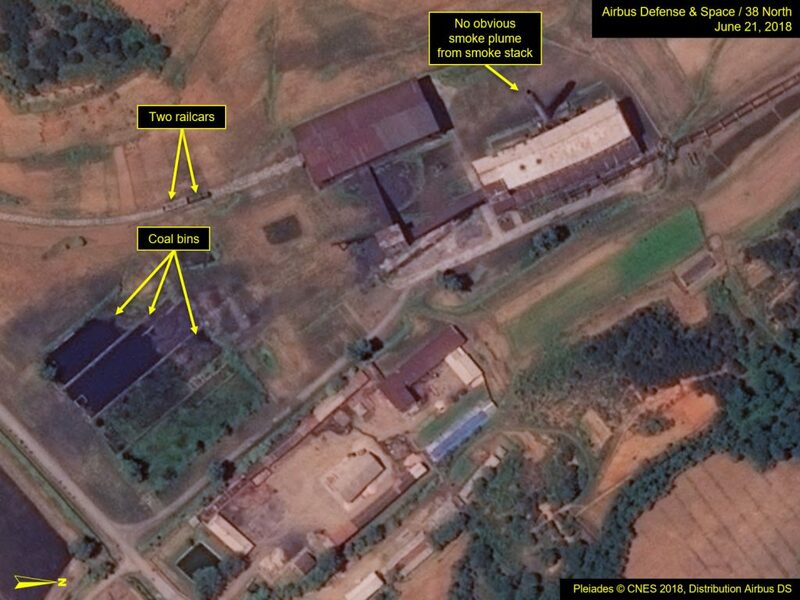 North Korea announced the suspension of nuclear and missile tests and made a show of shutting down a nuclear testing range for foreign reporters even before the summit. And on Monday, the US and South Korea announced that they “suspended all planning for the Ulchi Freedom Guardian,” an annual joint war game that was scheduled for August. 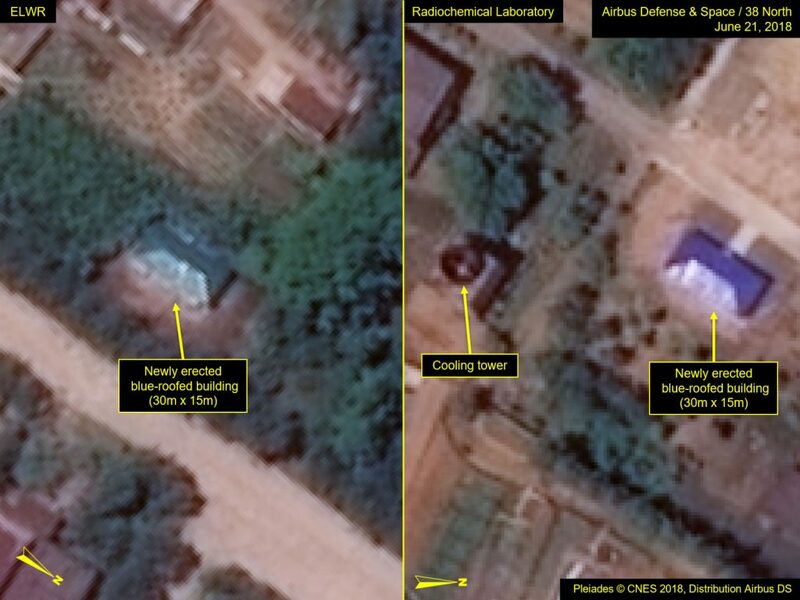 The exercises, which openly involved explicitly offensive operations and simulations of the invasion and assassination of North Korean officials, have always been a source of anger for Pyongyang and arguably a factor of tension on par with North Korea’s nuclear and missile tests, Asmolov noted. The US move is “a welcome response to all of the unilateral concessions that North Korea had made earlier,” Gregory Elich, an associate at the Korea Policy Institute, told RT. The exchange of concessions by the US and North Korea falls in line with the so-called “double freeze” suggestion, which was introduced by Moscow and Beijing as early as in September 2017, both experts said. It basically called for both parties to put on hold the actions that irritated the other side most, and it came amid a spree of hostile rhetoric coming from both Washington and Pyongyang. The double freeze was flatly rejected by the US at the time. “Even though neither of the two actually speaks a word [about “double freeze”], both de facto follow this path,” Asmolov said. Washington and Pyongyang have a long way to go to translate this initial diplomatic impulse into a more tangible agreement, of course, and Kim has good reasons to doubt Trump’s ability to deliver on a promise of a lasting solution, experts said. Trump himself withdrew from the Iran nuclear deal negotiated by his predecessor Barack Obama, and the next US president could backtrack on a Trump deal with North Korea. A binding deal with North Korea would require a ratification by the US Congress, which is infamous for bringing partisanship and electioneering into all sorts of foreign policy issues. So there you have it - the US agreed to the Chinese-Russian "double freeze" that it had rejected before - a freeze of US-SK exercises (not in the text of the agreement) and Kim agreed to a freeze on missile and nuke testing, and denuclearisation (in the text) but no timeline for it, and apparently no great urgency for it. Pompeo will return to Pyonyang "before too terribly long". US Secretary of State Mike Pompeo has said he will not put a timeline on negotiations for North Korea's denuclearisation, contradicting a senior defence official who said Washington would soon present a timeline to North Korea with "specific asks." Speaking to CNN in a telephone interview conducted on Sunday and reported by the network on Monday (Jun 25), Pompeo said he wanted to see continued progress towards North Korean denuclearisation and that the administration would regularly assess Pyongyang's seriousness about abandoning its nuclear programme. "I am not going to put a timeline on it, whether that's two months, six months, we are committed to moving forward in an expeditious moment to see if we can achieve what both leaders set out to do," Pompeo told CNN, referring to a Jun 12 summit between Trump and North Korean leader Kim Jong Un. Pompeo, who has been charged with leading negotiations aimed at persuading North Korea to give up a nuclear weapons programme that threatens the United States, said he would "constantly reassess" whether enough progress was being made to continue talks. "We hope that we will have an ongoing process of making progress," CNN quoted him as saying. Pompeo's remarks contrasted sharply with comments from a senior defence official who briefed reporters ahead of a trip to Asia by US Secretary of Defence Jim Mattis and said Washington would soon present a timeline to North Korea with "specific asks." Pompeo himself told reporters the day after the Singapore summit Washington hoped to achieve "major disarmament" by North Korea within Trump's current term, which ends on Jan 20, 2021. And Trump said last week the "number-one statement" in the document he and Kim signed in Singapore was "we will immediately begin total denuclearisation of North Korea," although there was no such statement in the text. In the joint statement, Kim "reaffirmed his firm and unwavering commitment to complete denuclearisation of the Korean Peninsula," but made no reference to a timeline, and going into the summit, Pyongyang repeatedly rejected unilateral nuclear disarmament. Referring to Trump's decision to suspend joint military exercises with South Korea, which North Korea has long denounced as provocative, Pompeo told CNN this move would last "only so long as there is a good faith negotiation progress, productive results being achieved. "If we can't do that, if it turns out that there is no capacity to deliver the outcome that both presidents said they wanted, yeah, we reassess." Pompeo said a week ago he would likely travel back to North Korea "before too terribly long" to try to flesh out commitments made at the summit. The State Department has since said it has no travel plans to announce. On Monday, Pentagon spokeswoman Dana White said defence officials would only speak to military-related aspects of negotiations on North Korea and that there was "no specific timeline" for the diplomatic process. CNN said Pompeo suggested it was too soon to expect a detailed roadmap after 40 years of tensions but insisted that Kim had been "unequivocal" about his willingness to denuclearise. "There are understandings that have been put together prior to the summit, some that took place when the president was in Singapore that I think put us on the right trajectory so that we can build out a framework for success," Pompeo said. This doesn't look much like they are getting ready to leave, but it should cut down on all the protests outside the gates. The US Army's headquarters in South Korea, located in the capital Seoul since the end of WWII, has moved to a $11bn base in the rural south – away from mass protest rallies and the North’s guns. The new United States Forces Korea (USFK) headquarters was opened on Friday at Camp Humphreys, a base near the town Pyeongtaek, about 70 kilometers (45 miles) south of Seoul, where the HQ was stationed for more than 70 years. The agreement to move the HQ, responsible for 28,500 USFK troops, was reached back in 2004. The relocation itself was initially scheduled for 2008, but the deadline was missed and later moved several times due to construction problems at Camp Humphreys. Now the transfer process is to be finalized next year, with Camp Humphreys becoming the largest US base overseas, housing 40,000 people. The US 2nd Infantry Division, currently stationed north of Seoul at Camp Red Cloud, is also expected to move to Camp Humphreys sometime in the future. Moving the USFK HQ further away from the DMZ means that it will be harder to hit with North Korea’s artillery whose guns are aimed across the border and capable of striking Seoul. 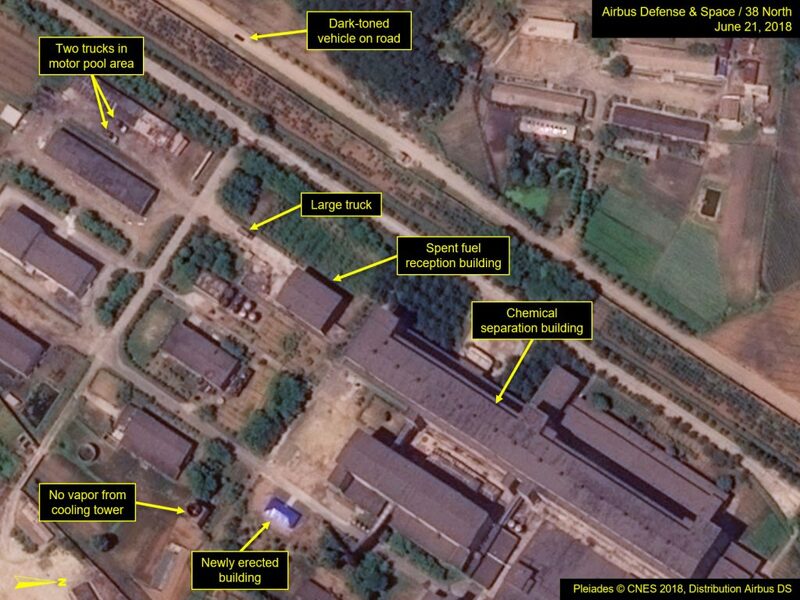 Pyongyang has thousands of artillery pieces deployed in the area and conducts large-scale ‘fire drills’. The main command center in Seoul also served as the symbol of the US Army’s presence in the country and attracted protests. Last year’s tensions between Washington and Pyongyang sparked several protest rallies in the capital and other areas. A wave of large protests against the plans to deploy THAAD anti-ballistic missile batteries in September led to clashes with the police. 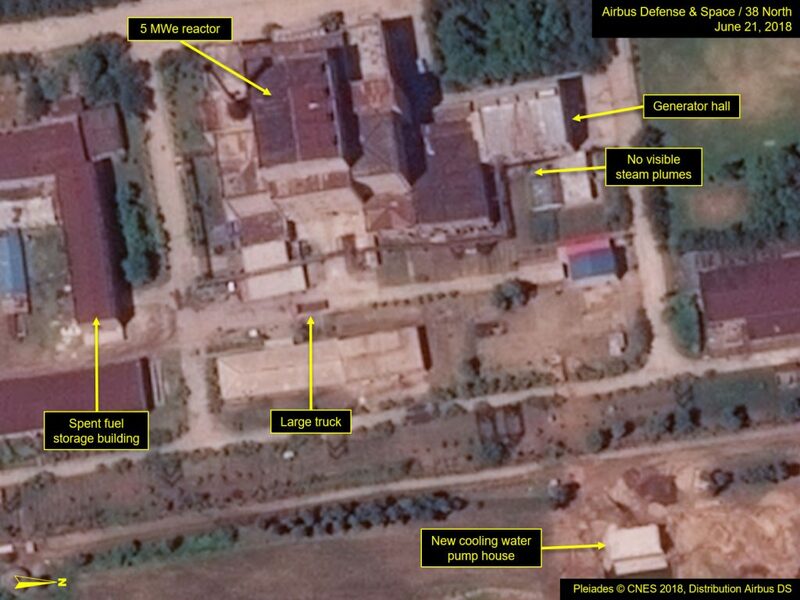 While the article is liberally couched with "we can't really tell what this is" clauses, it seems to suggest that enrichment work is on-going in NK. There is currently no agreement on how this is to be stopped, so it isn't deception, but the US could play it that way if it wants to start WW3. Pleaides © CNES 2018, Distribution Airbus DS. For media options, please contact thirtyeightnorth@gmail.com. Since late 2017, two new buildings have been constructed in the southwest corner of the Radioisotope Production Facility near the end of the rail yard line serving that facility. At least one of these new buildings could be intended to store rail-delivered chemicals to support operations in the main production building, as over the past month, a below-grade pipeline has also been completed that connects them with the main production building, thereby providing a possible means for transferring such chemicals. (Figure Little is known about this facility other than it was constructed in 2015, with various modifications since then. 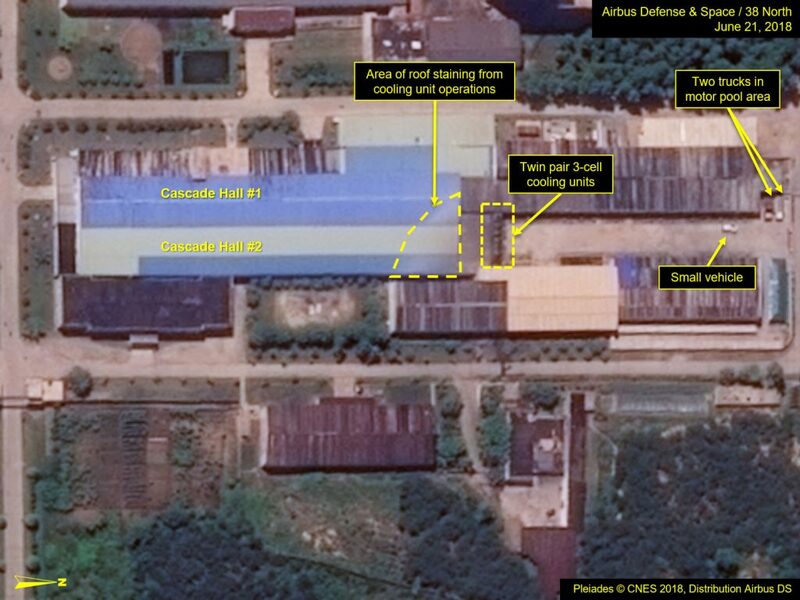 However, it is presumed to be a radioisotope production facility based on the internal layout and features observed remotely during its construction. Not losing face is a big factor in Asian cultures, so I doubt this will be received in the jolly manner Trump expects. Kim will think 'Why do they publicly highlight this insulting gift worth $1 before it is even given. If I accept it, everyone will laugh at me behind their hands. If I reject it and make a scene, everyone will call me a murderer, terrorist and prostitution ring mastermind. If I give him a gift of caligraphy saying “mentally deranged dotard.” will we all have a good laugh about it afterwards, or start WW3? Oh, that didn't go so well. So it's not to be unilateral denuclearisation. Pyongyang has voiced its regret over America’s attitude during high-level talks with US Secretary of State Mike Pompeo, and accused Washington of seeking unilateral and forced denuclearization from North Korea. International society has focused its expectation and attention on the DPRK-U.S. high-level talks for the implementation of the Joint Statement of the DPRK-U.S. summit after the first historic summit meeting and talks were held between the DPRK and the U.S.
We expected that the U.S. side would bring itself with a constructive proposal which would help build up trust true to the spirit of the DPRK-U.S. summit meeting and talks. We, on our part, were also thinking of doing something which corresponds with it. It was, however, so regretful to mention what the U.S. side had shown in its attitude and stand at the first DPRK-U.S. high-level talks held on 6 and 7 July. The DPRK side, during the talks, put forward the constructive proposals to seek a balanced implementation of all the provisions of the Joint Statement out of its firm willingness to remain faithful to the implementation of the spirit and agreed points of the DPRK-U.S. summit meeting and talks. These include taking wide-ranging proactive steps of simultaneous actions in a respective manner such as realizing multilateral exchanges for improved relations between the DPRK and the U.S., making public a declaration on the end of war first on the occasion of the 65th anniversary of the signing of the Korean Armistice Agreement to build a peace regime on the Korean Peninsula, dismantling the test ground of high thrust engine to make a physical verification of the suspension of ICBM production as part of denuclearization steps and making an earliest start of the working-level talks for recovering POW/MIA remains. Before the talks, Kim Yong Chol, vice-chairman of the Central Committee of the Workers' Party of Korea, who is also a chief delegate from our side to the talks, was authorized to convey with a due respect to U.S. State Secretary Pompeo a personal letter sent from Chairman of the State Affairs Commission of the DPRK Kim Jong Un to President Trump. But, the U.S. side came up only with its unilateral and gangster-like demand for denuclearization just calling for CVID, declaration and verification, all of which run counter to the spirit of the Singapore summit meeting and talks. The U.S. side never mentioned the issue of establishing a peace regime on the Korean peninsula which is essential for defusing tension and preventing a war. It took the position that it would even backtrack on the issue it had agreed on to end the status of war under certain conditions and excuses. As for the issue of announcing the declaration of the end of war at an early date, it is the first process of defusing tension and establishing a lasting peace regime on the Korean peninsula, and at the same time, it constitutes a first factor in creating trust between the DPRK and the U.S. This issue was also stipulated in Panmunjom Declaration as a historical task to terminate the war status on the Korean peninsula which continues for nearly 70 years. President Trump, too, was more enthusiastic about this issue at the DPRK-U.S. summit talks. The issues the U.S. side insisted on at the talks are all roots of troubles, which the previous administrations also had insisted on to disrupt the dialogue processes, stoke the distrust and increase the danger of war. The U.S. side, during the talks, made a great publicity about suspension of one or two joint military exercises. But suspension of one action called exercises is a highly reversible step which can be resumed anytime at any moment as all of its military force remains intact in its previously-held positions without scraping even a rifle. 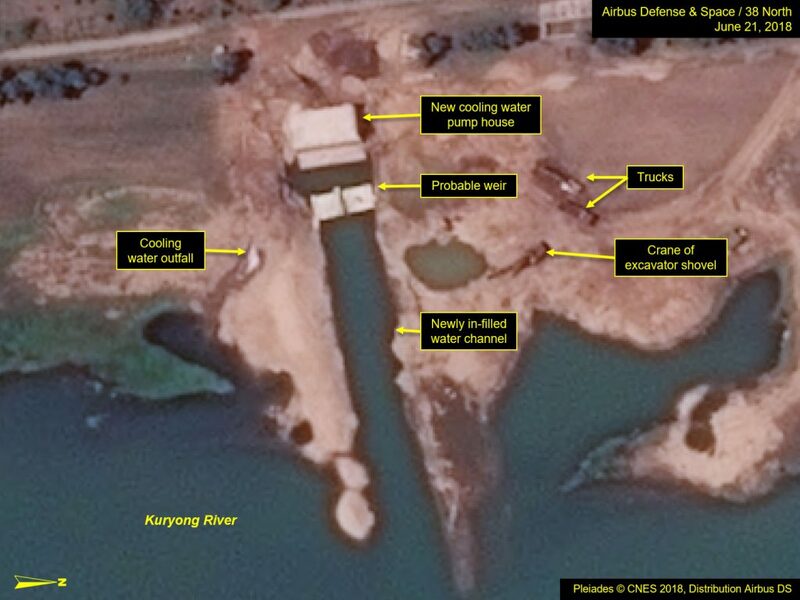 This is incomparable with the irreversible step taken by the DPRK to explode and dismantle the nuclear test ground. The results of the talks can't but be so apprehensive. We thought that the U.S. side would come with a constructive proposal which accords with the spirit of the DPRK-U.S. summit meeting and talks. But expectation and hope of ours were so naive as to be foolish. Conventional ways can never create new things. Treading on trite stereotype of all the failure would invite another failure only. Valuable agreement was reached in such a short time at the Singapore summit talks first ever in the history of the DPRK-U.S. relations. This is attributable to the fact that President Trump himself said he would move towards resolving the DPRK-U.S. relations and the issue of denuclearization of the Korean peninsula in a new way. The first DPRK-U.S. high-level talks this time brought us in a dangerous situation where we may be shaken in our unshakable will for denuclearization, rather than consolidating trust between the DPRK and the U.S. In the last few months, we displayed maximum patience and watched the U.S. while initiating good-will steps as many as we can. But, it seems that the U.S. misunderstood our goodwill and patience. 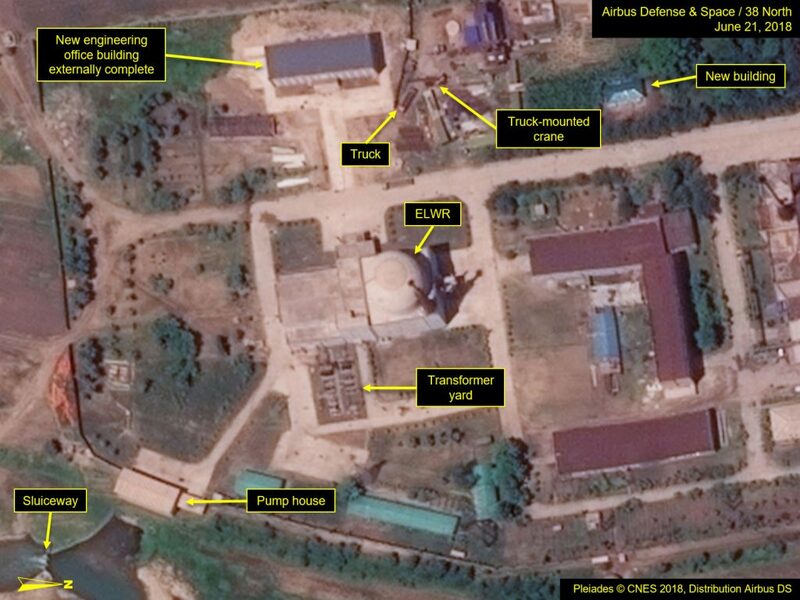 The U.S. is fatally mistaken if it went to the extent of regarding that the DPRK would be compelled to accept, out of its patience, the demands reflecting its gangster-like mindset. A shorter way to denuclearization on the Korean peninsula is to remove deep-rooted mistrust and build up trust between the DPRK and the U.S. For this, both sides should be bold enough to be free from old ways which had only recorded failures and resolve the problem in a fresh manner which is never bound by the existing ways. A shortcut to it is also to take a step-by-step approach and follow the principle of simultaneous actions in resolving what is feasible one by one while giving priority to creating trust. But, if the U.S., being captivated in a fidget, tries to force upon us the old ways claimed by the previous administrations, this will get us nowhere. Should the headwind begin to blow, it would cause a great disappointment not only to the international society aspiring after global peace and security but also to both the DPRK and the U.S. If so, this will finally make each side seek for another choice and there is no guarantee that this will not result into yet another tragedy. The U.S. should make a serious consideration of whether the toleration of the headwind against the wills of the two top leaders would meet the aspirations and expectations of the world people as well as the interests of its country. 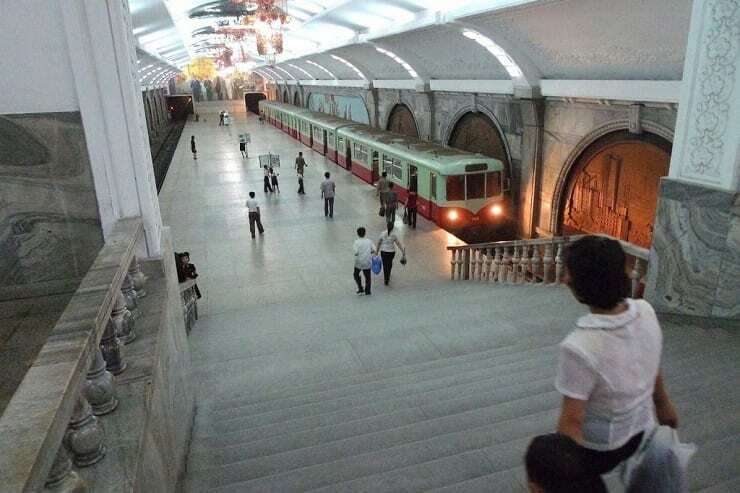 North Korea’s capital subway: clean, efficient, reliable. The still much maligned North Korea is a huge surprise to many visitors arriving in the country after lifetimes of immersion in the empire’s dishonest culture of disinformation. Here’s a quick and effective corrective. Disseminate widely.